Tanhui Modern Hotel | Hotel.com.tw-Provides brief hotel introduction, guest rooms, facilities, location information, mobile booking, and online booking service. Nestled in the popular Taiwan’s tourist point – Sun Moon Lake, Nantou, Tanhui Modern Hotel offers cozy accommodations for travelers to experience an unwind and carefree travel in Nantou. The hotel is excellence with convenient location next to Shuishe Pier where is a lake boat tour departs from, offers a distinguished way for one can enjoy the unspoiled natural beauties of Sun Moon Lake. Except for Sun Moon Lake, there are abundant natural tourist destinations that are worth a visit in Nantou, including Jiji, Puli, Chingjing, Xitou Forest Recreation Area, Shanlinsi Scenic Area, and Houtanjing Scenic Area. Nantou County is geographically set in the center of Taiwan, with a ultimate climate and laid-back atmosphere here, Nantou is a perfect year-round destination in for your Taiwan travel. Tanhui Modern Hotel Sun Moon Lake is a fashionable Nantou hotel that has a stylish yet warm interior with a variety of room suiting different needs. The furniture and fittings are a perfect blend of contemporary style and the romantic ambience, such as LCD TV, in-room wireless internet access, hairdryer, toiletries and many other pampering details, creating a soothing and cozy dwelling space for all discerning guests. A superior location near Sun Moon Lake and various stores and eateries adjacent to Shuishe Pier, guests at this hotel will experience impeccable accommodations, a welcoming atmosphere, and a warm and inviting staff, providing you an unforgettable Nantou travel. On a few seconds walking distance of the famous Sun Moon Lake, Tanhui Modern Hotel Nantou is a convenient hotel allows you have a relaxing trip to this popular site and avoid the hustle and traffic. Sun Moon Lake is a well-known scenic area of the center of Taiwan. The surrounding mountains, the distinct shape of the lake, the beauty of the picturesque scenery, a peaceful meandering bike trail around the lake, all make this area into a special spot that should not be missed. Moreover, there is a cable car connect the lake to the Formosan Aboriginal Cultural Village, a amusement park with a section contains displays of the nine Taiwan aboriginal tribes. The cable car also gives you a scenic panorama of the lake view and beyond. Stop at this Taiwan hotel to discover the nature and fun of Taiwan. 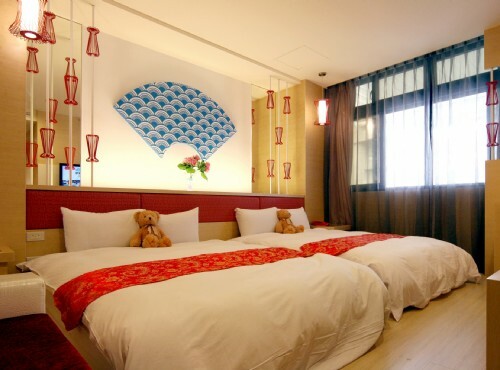 Through the online hotel reservation, you may reserve your Nantou accommodation at the Tanhui Modern Hotel fast and secure.